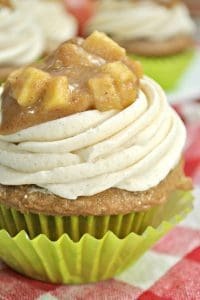 Delicious spiced cupcake recipe with cinnamon buttercream and apple pie topping. Perfect for baking for autumn and ideal for sharing this fall. Preheat oven to 180C degrees and line 2 12 hole muffin tins with cupcake liners. 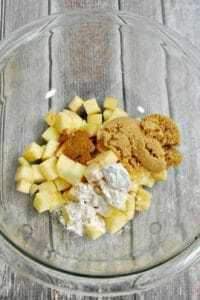 Mix up the simple cupcakes adding in the spices until combined well. Bake in the oven for 13-15 minutes until golden. 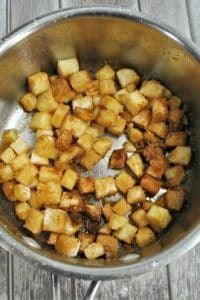 Stir in the apples, sugar and cinnamon. Mix in 250ml of the water until combined and cook on a low simmer. In a small bowl, combine the remaining water with the cornflour, and whisk lightly until smooth. Add the cornflour mix to the apples and cook 1-2 minutes more, this will thicken the mixture. Put aside to cool completely. Add all of the ingredients to your stand mixer and mix on a medium speed. Continue mixing until the frosting has stiff peaks and then add to a piping bag with a star nozzle. Pipe the frosting onto the top of the cooled cupcakes. Make sure that the top is flat so that apple pie topping can lay on top easily.